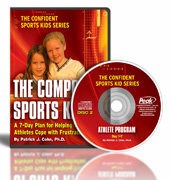 Improve Young Athletes’ Confidence and Success in Sports! Become The Ultimate Sports Parent! What would it be worth to you for your child to feel confident and successful in sports? How often do you opt to buy the latest and greatest sports equipment instead of investing in your child’s mental game skills for sports and life? You can become “The Ultimate Sports Parent” today and boost your child’s confidence, focus, and composure. 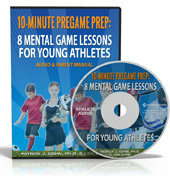 These special CD programs were designed especially for sports parents and their young athletes! In this program, kids listen to a ten-minute audio program just before each competition that teaches them a specific mental game skill. Simply load the audio onto their mp3 player or your phone before a game (we provide you with instructions). Along with the program, the parents’ and coaches’ manual helps you support your young athletes’ mental game before a competition. Or call us at 888-742-7225 to order. The Composed Sports Kid: A 7-Day Plan for Helping Young Athletes Cope with Frustration. This simple-to-follow workbook and CD program for young athletes and their parents/coaches helps kids cope with frustration and anger in sports. The 73-minute CD guides kids through each of the 7 daily lessons and offers step-by-step suggestions to help them through the workbook exercises. Parents can help their kids with the information in their own CD and manual, too. As your kids’ biggest fans, you need to understand the key concepts and strategies for boosting their confidence. Call us at 888-742-7225 to order any combination of workbooks. In this simple-to-follow workbook and CD program, young athletes and their parents/coaches learn about strategies for improving confidence in sports, such as managing expectations, and other confidence-destroyers. The workbook and CD are user-friendly, as kids are guided step-by-step through the workbook and the 7 daily lessons. They even get a little help in answering questions in the exercises. Also included is a CD and manual for parents or coaches to help you understand the key concepts and strategies to boost your kids’ confidence. “The Focused Sports Kid” helps sports kids who get easily distracted and can’t maintain their focus in competition. In this program, you and your athlete learn concentration-boosting strategies to help young athletes develop laser focus during competition. You get two programs in one: First, a CD and workbook program, just for kids, that walks them through each of the seven daily lessons to build and maintain focus. Second, parents or coaches get a CD and manual to help them understand the key strategies for boosting their kids’ focus! Now, you can tap into our secrets to sports success through a cutting-edge, 14-day program that helps young athletes overcome the top challenges young athletes face, as well as the top “mental game” challenges that cause such anxiety for sports parents. Through our extensive research, we’ve discovered that the parents of top-performing, happy, young athletes know how to support their kids in sports, and we’ll show you their secrets! In our 14-day program, you and your young athlete will learn just what it takes to cultivate confidence in sports! As if the ordinary pressures of sports weren’t enough to deal with, sometimes your kids have to deal with being bullied by other athletes, or even coaches! In this program, sports parents, coaches, and their young athletes learn mental game strategies to cope better with bullies. 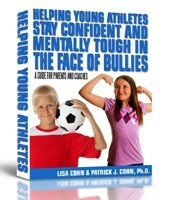 One CD/workbook program teaches parents strategies for understanding and stopping bullying in sports. In the second part of the program, kids, age 8 to 16, learn how to stay confident, focused, and composed in the face of bullies so they can stay in sports, perform well, and enjoy sports more. FREE for Kids’ Sports Psychology members! Using Dr. Cohn’s and Lisa Cohn’s many combined years’ experience in sports psychology, parenting, coaching, and sports parenting, we teach parents and their kids how to overcome perfectionism and fear of failure—the number one mental game challenge for kids in sports today. You’ll learn all our secrets for helping young athletes kick perfectionism and fear of failure so they can perform like they do in practice or training! Once your kids conquer perfectionism in sports, you’ll find that they’re likely to perform more freely, intuitively, and spend less time avoiding mistakes! KidsSportsPsychology.com is designed to help young athletes, sports parents, and youth coaches improve kids’ confidence and success in sports. We teach parents and coaches cutting-edge sports psychology strategies to help them improve their sports parenting or youth coaching skills. This online program provides members-only resources including mental game videos, e-books, articles, audios, question-and-answers, discussion forums and checklists. Another member perk: receive 30% off all workbook and CD programs! 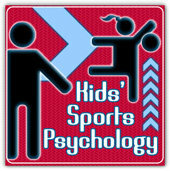 Take a FREE tour of Kids’ Sports Psychology! Get 30% OFF programs as a member of Kids’ Sports Psychology!